Kirstin M. Dvorchak was born in Enterprise, Alabama. When her military parents finally settled down, she was raised in Phoenix, Arizona. She earned undergraduate degrees in History and Political Science from Arizona State University’s Barrett Honors College in 2008. 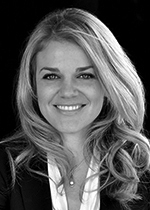 Prior to entering law school, Kirstin worked as a paralegal for The Elardo Law Firm, an insurance defense litigation firm located in Phoenix, Arizona which gave her a baseline understanding of the insurance defense world. Kirstin moved to Colorado to attend law school at the University of Denver, Sturm College of Law. While in law school Kirstin was awarded Best Oralist in the 2012 Vis Cup which guaranteed her a place on DU’s Willem C. Vis International Commercial Arbitration Moot team. As part of the ICA moot team, Kirstin represented DU in Shanghai and Hong Kong, China. She and her argument partner won the 3rd Annual MOOT Shanghai and, as an individual, she was awarded Best Oralist, 2nd Runner Up. Since graduating, Kirstin has remained active with the DU team, helping law students learn arbitration law and work on oral argument skills. In practice, Kirstin’s practice focuses predominately on defending first-party bad faith lawsuits filed against insurance companies. Kirstin enjoys how challenging the first-party cases can be given the overlay of complex medical issues, insurance company standards and practices, and the ever-evolving legal landscape in relation to C.R.S. § 10-3-1115/1116. Kirstin also handles a variety of third-party cases that arise out of automobile accidents, premises liability claims, as well as other incidents leading to personal injury claims. In the third-party context, what Kirstin finds most rewarding is developing a personal relationship with her client. This personal connection is important to ensure client trust, maximum ability to defend, and giving clients peace of mind knowing their legal matters are taken care of. Most notably, Kirstin is known as the crazy animal lady of the office; going home each day to three cats and an English Bulldog named Herbie. Personal injury lawsuit filed by Jill Burke on behalf of her daughter, Cambree Staidl. On the night of the accident, Ms. Staidl was traveling to the homecoming dance with the defendant, Dylan McKenney and his mother, Sandra. After losing his way on country roads, Mr. McKenney rolled through a stop sign and was subsequently t-boned by a Ford F150, pulling a trailer carrying ATV’s. Ms. Staidl sued Mr. McKenney and his mother, arguing that she sustained numerous injuries, including post-concussive headaches that greatly impaired her ongoing education, social activities, ability to work, and general quality of life. Plaintiff asserted that her damages – for the duration of her life – totaled nearly eight million dollars. The jury, however, awarded approximately $11,500, against the defendants representing the emergency room bills on the night of the accident. Additionally, in post-trial briefing, it was determined that the defendants were the prevailing party and costs were awarded against the plaintiff. Ms. Dvorchak sat second chair with Rebecca Wagner at this trial. Plaintiff filed suit against Defendants apartment owners and property managers, claiming they were responsible for the serious injuries Plaintiff suffered as the result of the fire started by an arsonist. The Plaintiff claimed the arsonist was a tenant of the apartments, whose rent was paid for by a public program that assisted low income residents that suffered from mental illness. The Plaintiff claimed the Defendants were responsible, in whole or in part, for the acts of the alleged arsonist. The Plaintiff’s last settlement demand was $1 million. Defendants filed a motion for summary judgment, which was granted by the Adams County District Court, which dismissed all of Plaintiff’s claims. This Order was then affirmed by the Colorado Court of Appeals, and the Plaintiff’s Petition for Certiorari was denied by the Colorado Supreme Court in October 2017. Ms. Dvorchak worked on this case alongside Mike Frazier. Plaintiffs, whose home sustained smoke, soot, and heat damage in the Waldo Canyon fire, sued their insurer for breach of contract and bad faith, claiming the company failed to properly adjust their loss or adequately compensate them for their damages. At trial, Plaintiffs sought contents and dwelling contract damages in excess of $290,000, treble damages and attorney fees. Prior to trial, the Court dismissed the Plaintiffs’ common law bad faith claim. The jury returned a verdict of $36, 496 for property damage, and a defense verdict on the statutory bad faith claims. Ms. Dvorchak sat second chair with Clif Latiolais at this trial. Homeowner sued insurer for benefits to pay for flood damage under homeowners’ policy following a severe storm in which water overflowed through basement window wells. Plaintiff alleged water fell from roof into window wells, and thus did not constitute flood water. Court of Appeals affirmed grant of summary judgment to our client insurer upon grounds that the loss was excluded as flood water. Ms. Dvorchak worked on this case alongside Colin Campbell. Plaintiff sued client insurer for uninsured motorist benefits, and for common law and statutory bad faith with regard to head injuries sustained in an auto accident. The jury found in our client’s favor on the bad faith claims, by finding that the insurer’s handling of the claim had been reasonable. The jury further found that the plaintiff had breached the policy’s cooperation clause with regard to our client’s investigation of the claim. The breach of the cooperation clause nullified any obligation to pay further benefits, resulting in judgment for our client on the contractual claim as well. Ms. Dvorchak sat second chair with Colin Campbell at this trial. Plaintiffs sued their insurer for breach of contract and bad faith in its handling of a property loss claim arising out of the Waldo Canyon fire. The home adjacent to the Plaintiffs’ home burned to the ground, and Plaintiffs sought claimed sought contents and dwelling losses in excess of $150,000, treble damages and attorney fees. The jury returned a total defense verdict for American Family. Ms. Dvorchak sat second chair with Clif Latiolais at this trial. Plaintiff sought property benefits under his homeowner’s policy for damages caused by a tree which struck the house after it was struck by lightning. The parties disputed whether the tree fall or the lightning strike compromised the structural integrity of the home. Plaintiff sought recovery of $278,000 in contract benefits at trial. The jury awarded $34,802 in contract benefits, of which $11,000 had been unreasonably delayed in payment. Ms. Dvorchak sat second chair with Colin Campbell at this trial. The plaintiff was seriously injured in a single car accident while being driven home from a keg party by an intoxicated friend. The keg party had been hosted by four roommates at their rental home in Boulder. The Court of Appeals affirmed summary judgment entered in favor of our client by finding that Colorado social host dram shop liability requires proof that the defendant knew the person drinking on the defendant’s premises was underage. Ms. Dvorchak worked on this case alongside Colin Campbell.